You can check your points and ask other attendance related questions by email. This process may take 1 or 2 days. This service is operated by United Airlines. Important: they will send their response to your United.com email address, not your personal email. Got a more complicated question? Safely managing your attendance is critical. Of all the performance issues that exist, none present more of a risk to our careers than being accused of poor attendance. This includes outages, not being in our work area, leaving too early and misuse of FMLA. Agents can ask virtually any attendance related question. This service is not provided by anyone at Local 811, we just want to make sure you have easy access to it. In addition, Texas requires United Airlines to follow our state's "Reasonable Accommodation" laws. These rules apply to workers that can perform their job duties, but who may require reasonable workplace accommodations due to a health concern or minor disability. 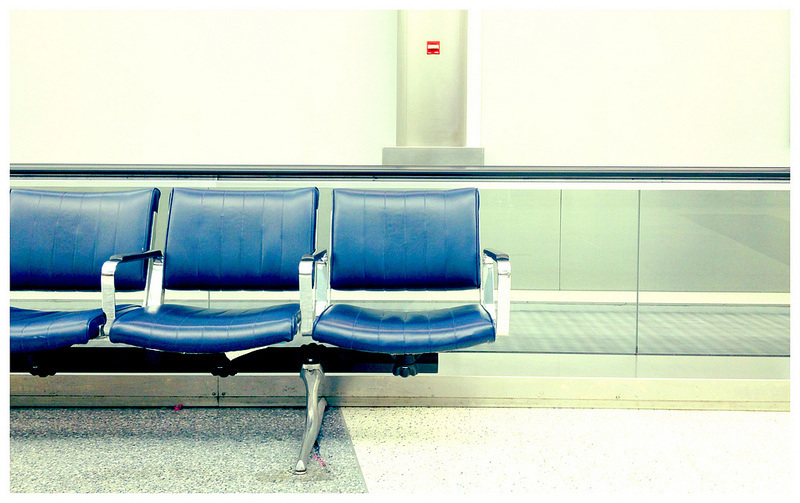 To find out more about United Airlines' Reasonable Accommodation process, see the resource office, or call the Employee Service Center at 877.825.3729. SKP – 1.0 point, Employee calls the IVR before the start of their shift and advises they themselves are sick. Employee has available hours in sick bank. 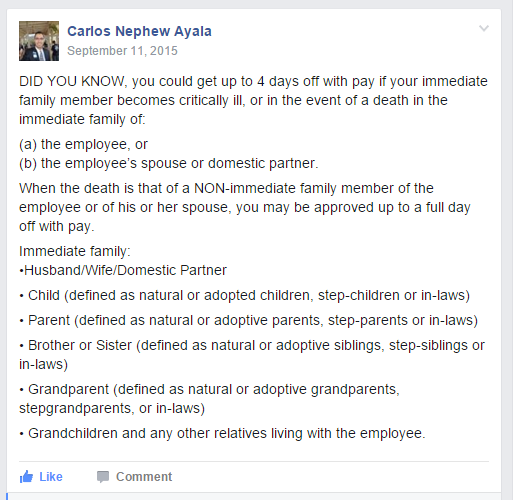 SKDP – 1.0 point, Employee calls the IVR before the start of their shift and advises that one of their qualified dependents is sick (maximum three times per calendar year). Employee has available hours in sick bank. SKU – 1.0 point, Employee calls the IVR before the start of their shift and advises they are either sick themselves or a qualified dependent is sick. Employee has no sick hours to use in sick bank. NCNS – 3.0 points, employee fails to call IVR prior to the end of their shift to notify the Company that they will be absent. LTNC – 2.0 points, employee calls the IVR after the start of their shift to notify the Company of their absence. The portion of the shift between when the employee’s shift starts and when they notify the Company is unpaid. The remaining portion of the shift is paid if the employee has hours accrued in the appropriate bank otherwise it will also be coded unpaid. LE – 1 to 6 minutes late to work. An employee is allowed three LE’s and/or LO’s in a rolling 365 day calendar. Subsequent LE’s incur 0.5 attendance point. LO – 7 to 14 minutes late to work. An employee is allowed three LE’s and/or LO’s in a rolling 365 day calendar. Subsequent LO’s incur a 0.5 attendance point. LT – 15 minutes or more late to work. Each instance results in a 0.5 attendance point. EAUT – 1.0 point, First occurrence in a calendar year of failure to report for an assigned overtime shift or the third and subsequent times in a calendar year that employee cancels overtime 10 or more hours prior to the start of the overtime shift. IAUT – 3.0 points, Second or subsequent occurrences in a calendar year that an employee fails to report for an assigned overtime shift. EAUT – 1.0 point, First occurrence in a calendar year that an employee leaves work before the end of their scheduled shift/trade or First occurrence in a calendar year of leaving early from an assigned overtime shift with notification to management but not approval. IAUT – 3.0 points, Second or subsequent occurrences in a calendar year that an employee leaves work before the end of their scheduled shift/trade or Second or subsequent occurrences of leaving early from an assigned overtime shift with notification to management but without approval. The FMLA process has changed. 1. Call the Employee Service Center at 1.877.825.3729 to confirm your eligibility for FML. You will also get your FML case number at that time. 2. Ask your doctor to complete the FML form, and then fax it to 1.847.700.3084. 3. You will be notified via your United email and USPS (regular mail) of the decision regarding your FML request. If additional information is required, you will have 15 days from the date of the decision letter to get the additional information turned in. 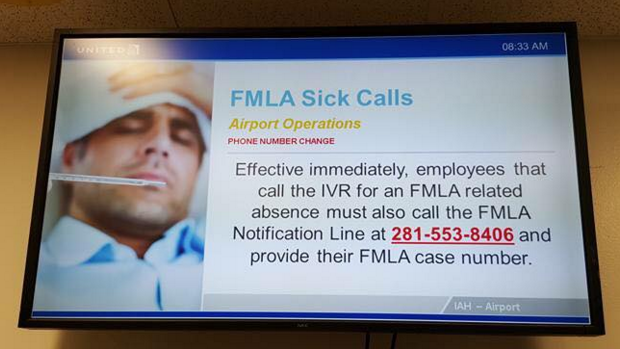 Once approved, you will need to call the FMLA NOTIFICATION LINE each time you call out on the IVR with an FMLA related outage at (281)553-8406. Provide them with your case number (which you will get when your FML request is approved), to ensure that your outage is properly coded. STEP TWO: The Sick Call Line has added a new option to report the FML outage. When prompted, select the FMLA option and provide them with the FMLA case number that you received when you were notified that your FMLA request was approved. ﻿What if I have been unfairly denied FMLA?